Michael McElhatton (left) owner of The Greenvale Hotel in Cookstown Co. Tyrone in Northern Ireland, where three young people died at a party that was being hosted at the hotel on St Patrick's Day evening. A hotel owner arrested on suspicion of manslaughter after three teenagers died outside a St Patrick’s Day disco has been released on bail. 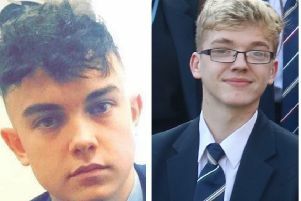 Students Lauren Bullock, 17, Connor Currie, 16, and Morgan Barnard, 17, died after a crush at the Greenvale Hotel in Cookstown on Sunday. Michael McElhatton, 52, owns the Co Tyrone premises and will return for “further questioning at a future date”, the Police Service of Northern Ireland said. He was further arrested on suspicion of possession of Class A drugs with intent to supply but fast-track forensic analysis swiftly ruled out the possibility, and he was subsequently de-arrested. Last night Assistant Chief Constable Mark Hamilton said: “Further to our statement on the arrest earlier today of a male in connection with a Class A drug we would like to add the following clarification. “As a consequence of the arrest of a person on suspicion of manslaughter a search was carried out at the home of the suspect. The search discovered a medium size clear polythene bag containing an amount of a white powdery substance and pieces of tin foil. “This discovery led to the suspicion that the substance was a Class A drug. “In line with normal procedure the suspect was arrested on suspicion of possession of a Class A drug with intent to supply. This arrest was communicated to the media in line with procedure. “Given the gravity of the investigation the examination of the bag was carried out urgently. “Once opened by the Forensic Science Agency for Northern Ireland the substance inside the bag was ascertained to be an innocent substance. The suspect was then de-arrested in respect of the drugs offence and a communication made to the media. “The PSNI would like to make it clear that there is no suspicion of any crime relating to misuse of drugs on behalf of the person who still remains in custody. Another suspect arrested on Tuesday on suspicion of manslaughter is a member of the popular nightspot’s door staff. Hundreds of mourners have left written and floral tributes to the three teenagers. A group of young teenage girls escorted by their families leave floral tributes at the entrance of The Greenvale Hotel. On Wednesday DUP leader Arlene Foster signed a book of condolence in Cookstown. She said: “I cannot begin to comprehend the pain and anguish the families of Lauren, Connor and Morgan are going through at this time. 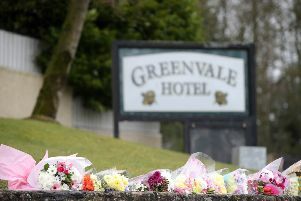 Flowers left in tribute at The Greenvale Hotel (Liam McBurney/PA)She added: “The tragic loss of life has been felt across the entire area of Cookstown, Dungannon and beyond. Up to 400 people were present as the tragedy unfolded, and detectives said it was fortunate more were not killed. Police confirmed some were trampled underfoot as they waited to enter the disco. Buses let youngsters off outside before the disaster happened. Counselling services are being provided to those affected and prayer services have been held.